40½ in. (103 cm.) high; 19½ in. (49.5 cm.) diam. This ormolu 'Roman' lamp, with acanthus-enrichments in the early l9th Century Louis Quatorze fashion, displays a reeded 'Etruscan' oil-vase on an antique fluted tazza, whose festive satyr-masks guard its light fittings. In his Lighting in the Domestic Interior, London, 1991, p. 134, fig. 451, Jonathan Bourne illustrates a related colza oil lantern pattern from an 1820s trade catalogue, together with an interior drawing by C.C. 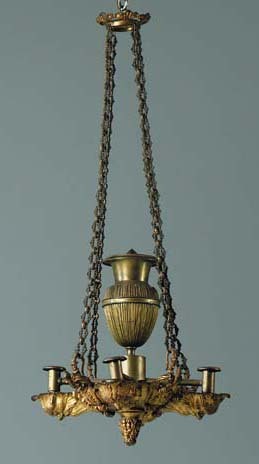 Hunt that shows a lamp together with its glass 'vase' shades (p. 133, fig. 446). A related satyr-masked lamp from Callaly Castle, Alnwick, Northumberland was sold, Christie's House sale, 22-24 September, 1986, lot 14, and illustrated in Country House Lighting, Temple Newsam House Studies no. 4, Leeds, 1992, p. 85, fig. 66. A pair of related ormolu hanging lamps, with garlanded baluster vase-shaped reservoir, palm leaf corona and open-mouthed satyr masks quartering the acanthus-wrapped bowl are currently hanging in the hall of The Garrick Club, London.